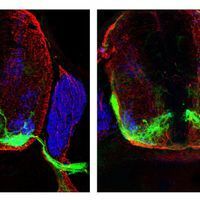 COURTESY OF HONGKUI DENGOver the past several years, scientists have been in hot pursuit of finding an efficient way to directly transform skin cells to brain cells—skipping an intermediate pluripotent step. Genetic approaches have worked to varying degrees. Now, two independent groups report having made the process even simpler, by soaking fibroblasts in combinations of small molecules, thereby obviating the need to tinker with gene expression to turn the cells into neurons. “These two studies really show that if you just manipulate intercellular signaling pathways, cell fate can be changed,” said Chun-Li Zhang, a neuroscientist at the University of Texas Southwestern Medical Center, who did not participate in the research. The first direct conversion of a somatic cell to a neuron, by means of inducing particular genes, was reported in 2010 by Marius Wernig’s group at Stanford University. Since then, numerous studies have shown it to be possible, but imperfect. Sheng Ding, a stem cell biologist at the Gladstone Institute of Cardiovascular Disease and the University of California, San Francisco, pointed out that efficiencies are never 100 percent—meaning researchers end up with a heterogeneous culture of reprogrammed and not-so-reprogrammed cells. Zhang also noted that scientists have been unable to get their favored neuronal subtypes. The conventional approach also requires genetic manipulation, which can be difficult for in vivo projects. And two studies published this summer in Nature Biotechnology found that direct conversion methods to produce neural stem cells that employ the traditional reprogramming genes actually pass the cells through a pluripotent step. In 2013, Deng and his colleagues showed it was possible to convert somatic cells to induced pluripotent stem cells via chemical means alone. For this latest study, published today (August 6) in Cell Stem Cell, Deng’s team screened for compounds that would promote the efficiency of a transcription factor involved in neuronal conversion. The researchers first found four small molecules that could induce immature neurons from mouse fibroblasts, but these were inefficient. After another screen, they identified I-BET151, which could “dramatically facilitate the reprogramming and enhance the functional maturation of the induced neurons,” Deng told The Scientist. Importantly, Deng’s group found that I-BET151 suppressed the transcriptional program of fibroblasts. 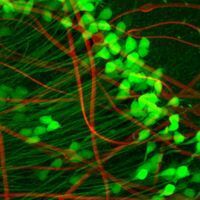 About half of the treated cells showed functional properties of neurons, such as action potentials, Deng said. 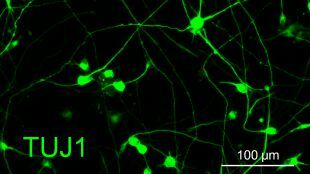 Gang Pei and Jian Zhao of the Shanghai Institutes for Biological Sciences and their colleagues have also devised a chemical recipe to induce neurons from fibroblasts. 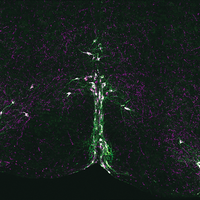 In their study, published alongside Deng’s in Cell Stem Cell, the researchers converted human fibroblasts to neurons using a combination of seven molecules applied to the cells for one week, followed by a three-week maturation period in a medium containing two of the reprogramming molecules and one other molecule. “These hciNs [human chemical-induced neuronal cells] show similar morphology, gene-expression profiles, and electrophysiological properties” to neurons derived from pluripotent stem cells, Zhao wrote in an email to The Scientist. “The induction efficiency of our chemical approach is comparable the that of the [transcription factor]-induction protocols.” Zhao’s method, like Deng’s, also downregulated fibroblast-specific genes. It’s not entirely clear how the chemical cocktails work. Both recipes call for Forskolin (a cyclic AMP promoter) and CHIR99021 (a glycogen synthase kinase 3 beta inhibitor), implying that they may have overlapping mechanisms. Deng pointed out that the molecules his team used also act upon genes that determine neuronal fate (NeuroD1 and Ngn2), while the other team’s recipe impacted a different set of genes. “If this is real, it would provide an avenue to understand the mechanism” of neuronal programming, said Ding at the Gladstone Institute. “Maybe after we understand this, something new could be developed for therapeutic applications. 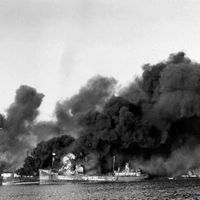 In its present form, it’s hard to predict,” he added. Ding cautioned that, like any new method, both approaches reported today require optimization and independent validation. W. Hu et al., “Direct conversion of normal and Alzheimer’s disease human fibroblasts into neuronal cells by small molecules,” Cell Stem Cell, doi:10.1016/j.stem.2015.07.006, 2015. X. Li et al., “Small-molecule-driven direct reprogramming of mouse fibroblasts into functional neurons,” Cell Stem Cell, doi:10.1016/j.stem.2015.06.003, 2015.